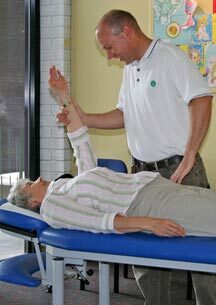 Dr Sandy (Chiropractor) adjusting a client. The Sacro Occipital Technique (SOT) of Chiropractic care is an analysis and adjustment system that allows the qualified chiropractor to assess the body’s posture, balance, organ function, cerebrospinal fluid (CSF) flow and then develops a picture of your relative health and vitality from an inside-out perspective. The adjustment comprises an assessment of your posture, relevant muscle and nerve reflexes, the use of wedge shaped blocks to balance the pelvis with your respiration and the use of reflex points and an Activator® instrument to gently realign the spinal column. The aim of these adjustments is to remove the interference to normal nerve and to correct CSF flow around the brain and spinal cord this can allow for more adequate nutrition of the nerves and improves the removal of waste products from the nervous system.